2019 has some beautiful trends to elevate your space. We’ve done the research and found what’s trending according to our favourite designers and taste-makers! Read on for all the fine details. Life is busy in the 21st century and it seems like families are constantly looking for ways to simplify their space. Multifunctional furniture is a great way to keep spaces tidy and do more with less! Décor is heading in a more authentic and hand-made direction, replacing the ultra-modern, manufactured look. People are seeking more practical, handcrafted items that tell a story. We’re already noticing a blackened version of the classic white oak, providing that comfort and maturity to ground bigger spaces. The bedroom should be your escape, the place you go to feel nurtured and cared for. Comfortable textiles are very in right now, with upholstered bedframes and layers of coziness. Tight, tribal patterns seem to have run their course and instead we’re being flooded with over scaled and sometimes asymmetrical shapes. The pastels of the Art Deco influence are still very prominent. Expect to see colours like blush, olive green and maroon paired with golds and retro patterns. Bright, beautiful jungle and floral patterns are popping up everywhere, and in an abstract way. We’re also seeing dark, moody wallpapers and even hand-painted murals. 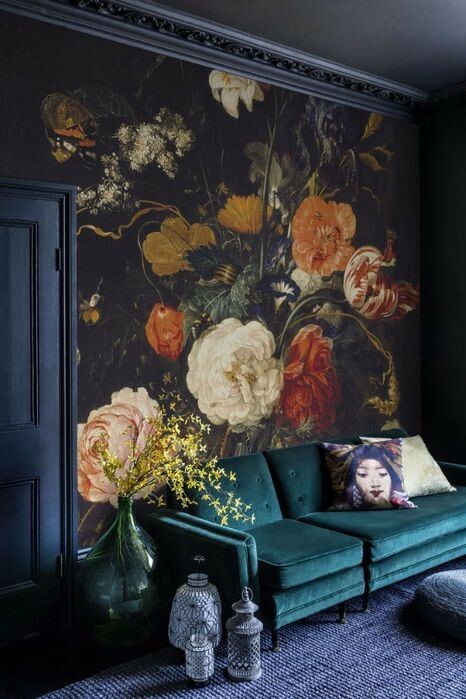 Let us know your thoughts on our twenty-nineteen interior trends and if you will incorporating into your designs? Need help pulling your look together or don’t know where to start? Contact us today to setup a consultation!